For the last few months, the Ottawa Senators message boards, call-in shows and fan chatter have been buzzing with the sound of ‘fans’ saying that we have to get Jay Bouwmeester. 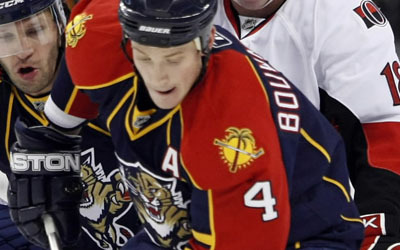 As the most sought puck moving defenceman in the league, Bouwmeester is going to be a free agent this summer, but I can guarantee you that he will not be wearing a Sens jersey come October, and it all has to do with finance and the cap. If we were somehow able to dump some significant salary, we’d only have enough cap room to have Bouwmeester for 1 year. At the end of the 2009-2010 season, assuming the cap doesn’t go down (which it will), the Ottawa Senators will have less than 14 million to re-sign 12 players. Murray currently has about 14 million at his disposal but has a few players to re-sign or replace this summer, both of which will take away from that 14M. I would expect at minimum 3 out of those 5 players to be re-signed this summer. Come the summer of 2010, we’ll have approximately 9 million to re-sign all those players. Even if we replace some or most with junior players, which is likely to happen, that is still a salary that counts against the cap. Volchenkov, if we can manage to keep him, will be in for a raise (I’d expect 3.5-4.5M). Schubert and Auld are almost guaranteed to not be re-signed if they are still around. Smith is unlikely to be re-signed. Foligno and maybe Campoli are almost sure bets be to re-signed, and its up in the air for the rest. There’s also the matter of our current highly paid players. We have 3 players making more than 7 million next year. Add Bouwmeester and that would be 4 players that would eat up more than 55% of your cap space (assuming a cap of 52M). Add Fisher’s 4M and that’s 5 players taking up 62% of your salary. Alfie, Spezza and Heatley are not going anywhere. I very much doubt any team would take on Fisher’s salary, so even if we wanted to trade him we wouldn’t be able to find a willing dance partner (that’s assuming Fisher would waive his no trade clause). No well rounded, cup contending team can afford to have 4 players making more than 7 million in this cap era. If by some miracle the cap space magically goes up to 65-70 million next year and is guaranteed to stay at those levels for 3-4 years and Melnyk allows Murray to spend the full 65-70M, we could afford to go after Bouwmeester. But that’s not going to happen. If it were to somehow magically happen, I think the Sens would benefit more by getting a guy like Cammalleri, as the Sens are in need of bonafide 2nd line scorer.